mitcho (California) on 2014-04-25 17:44:22. Photography is excellent-varying from wide angle and scenic shots to excellent closeups. 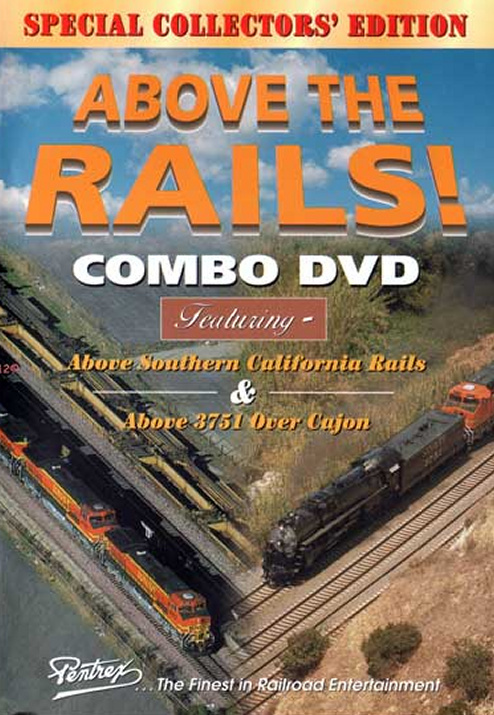 I am not much of a fan of contemporary railroading so the "Above California Rails" portion was only mildly entertaining. I did wish they had more on the container loading and unloading and the hump yard operation. The "Above 3751 Over Cajon" was outstanding! A whole new angle for rail fans. Being able to see the route as she winds through Cajon Pass was very revealing and gave a different prospective. Sound quality is first rate and you did not hear the the helicopter engine nose as in some other videos. I would like to see this done for other pan trips. Jeffrey O on 2008-03-30 10:18:03. I thoroughly enjoyed this video. I really liked both programs, but the 3751 one I truly enjoyed as I did not have any steam shows in my collection. Good job, it's definitely worth it. Above the Rails is just what this video is. It's a very interesting look at railroading from a view few of us ever see. The 1st segment, Above Southern California Rails, is shot entirely from a helicopter. We are shown a wide variety of angles of various trains in and around Los Angeles and to the south along the Pacific Ocean. You never really know for sure what you see next. Freight, passenger and commuter trains all make an appearance in this segment. Quite interesting indeed. Segment # 2, Above 3751 Over Cajon, starts on the ground, and later takes to the air in a helicopter. Throughout the segment, there are many ground shots as well, all the way to Barstow. It's interesting to see the crowds that came out for the running of this train. Like segment # 1, there are shots from all angles from the air. Very impressed with the video and highly recommend it to all rail fans. "It's interesting to see the crowds" I'm wondering how they got to most of the off road places on the route. I've driven the Cajon Pass probably a hundred times and haven't the slightest idea how they got to these off road spots. chris collins (fletcher north carolina) on 2017-11-08 22:42:15. Steamboy (Revere MA US) on 2016-07-26 19:59:00. The First Segment was shot in 1998 to January 1999, Plus the second segment was an extended version of 3751's preparation and running on a freight to Railfair '99. (More Action from Barstow To Railfair '99 can be seen on "Sacramento Steam '99").